Speaking is a fundamental language skill. It is the primary way in which we communicate information. When we ask how well we can function in a second language, we ask the question “how well do you speak…?”, so it is the ability to speak well which best represents our proficiency in another language. As teachers, however, we must be mindful that speaking involves more than simply using words to articulate what we are thinking, and there is more at play than simply asking students to say the words that they know. Being a ‘good speaker’ requires a range of skills beyond accurate grammar, vocabulary and pronunciation, though these are the basic building blocks that enable a message to be understood. An effective communicator chooses the words they use, and the way in which they speak to different people in different situations, whether that is ordering a sandwich at a snack bar or giving a keynote speech at an academic event. The skills involved in how we interact with others in different ways are called communicative competencies: teachable skills which frame the language used in interaction in different settings. Speaking as a language skill involves these competencies much more than it requires accuracy of language, so when we talk about ‘teaching speaking’, we are talking about something different from grammar or vocabulary practice. Speaking can be used to practice new language (as is common in question-answer tasks or role-plays held after specific language instruction, but this kind of activity may not teach the skill of speaking itself. Just as we can instruct, present and practice specific grammar features to students, the component competencies which make up speaking as a pure language skill can also be broken down and presented systematically. Notice that none of these sub-skills make specific reference to grammar, vocabulary or pronunciation, though obviously these are necessary for students to communicate what they want to say. In order to bring the focus onto these competencies, it is therefore advisable to lead speaking tasks on topics that are familiar to students, and using language that is within their ability. Taking the strain of new language out of speaking activities allows students to focus on the pure sub-skills listed above. This is similar to the way in which native speakers are ‘trained’ for public speaking or assertiveness in social situations: as native speakers, they are comfortable with the structure of their own language, but want to develop other skills which go along with that. Many of these features of speaking fall into the category of discourse – the organisation and style of a message as it is delivered in different situations. When teaching speaking in a given context, think about how people actually speak in that situation. 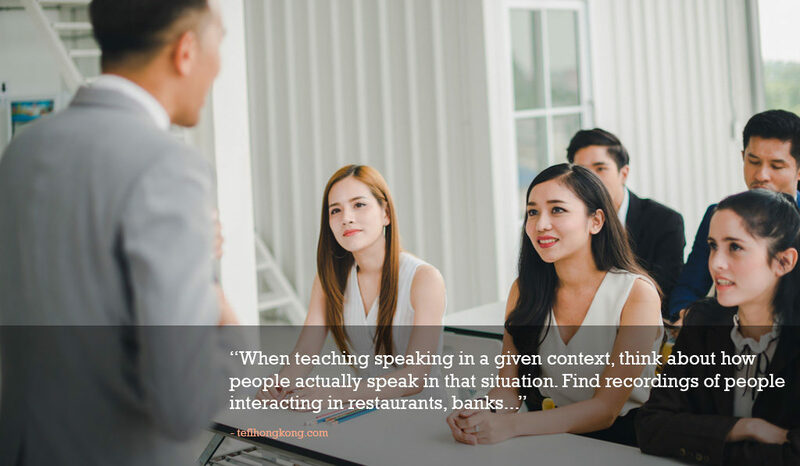 Find recordings of people interacting in restaurants, banks, or wherever your lesson will be set, and think about the functional steps of the interaction as it happens. You will probably find that most interaction that you listen to is quite formulaic and predictable, so can be used as a structure for the dialogues that you present and practice in class, only with the organisation and ordering of the speech as the focus of the class rather than the specific language used. Taking an opposite approach, think of situations where the above list of competencies is common. For example: we often use circumlocution when we are talking about complex, technical subjects, like when we describe a problem we are having with a gas cooker, car engine or plumbing; we may not know the exact name of the part which is not working, but we can still communicate it to a gas fitter, mechanic or plumber. This is a useful life skill, and one which can be used to harness second-language speaking for language learners. Again, as with grammar and vocabulary, we can incorporate these target competencies into standard formats of lessons – we can present the feature of speech through an audio or video task, and then ask students to practise applying the feature in a restricted task. Gapped dialogues, ordering lines in a script, or choosing the best alternative from three different responses in a conversation, for example. Again, as long as the learners are playing with language they already know, their ‘discourse brains’ will be more engaged and they will have more focus on the competencies they are learning. Free speaking tasks should be exactly that: student-student interaction which does not have too many limitations. Give students a topic or situation and ask them to script out a typical interaction in that situation. Assign roles to different students, so that they can practise speaking to different ‘people’, and see how they flex their ideas when talking to their boss as compared to their 7-year-old daughter. This will open up the features they are learning in application to different types of speech. Finally, be aware that although your learners have been focusing on these great features of spoken communication, they have not yet had the opportunity to fully apply these until they have spoken totally freely, without a script, or notes to work from (after all, native speakers don’t carry scripts around with them to use in sandwich bars, though they do have an ‘expected script’ in their mind which informs their use of language), by participating in a speaking event with another student or students. The same dialogue that was used in free practice can be repeated, though with different participants to ensure spontaneity and flexibility with language. Only then can you say that students have truly applied what they are learning by the end of the class. All in all, when planning a speaking skills lesson, be aware that using language in speech is not necessarily practice of speaking as a language skill. Developing the range of competencies that make ‘a good speaker’ takes focus on the ways that we speak to different people, and the ways we construct what we are saying. This is independent from the grammar and vocabulary we use in real life, so should be kept separate from pure language input in the language classroom. Admin Message: For more ways of working with speaking as a language skill, Tom Garside has published an e-resource for language teachers which develops some of the ideas in this article. Available for USD9.99 from https://store.bookbaby.com/book/Tesol-A-Gateway-Guide-for-Teachers-of-English. This book offers teaching ideas and the theories behind language learning and teaching in a user-friendly and constructive way.